You know the old joke about going to fight and a hockey game breaking out? 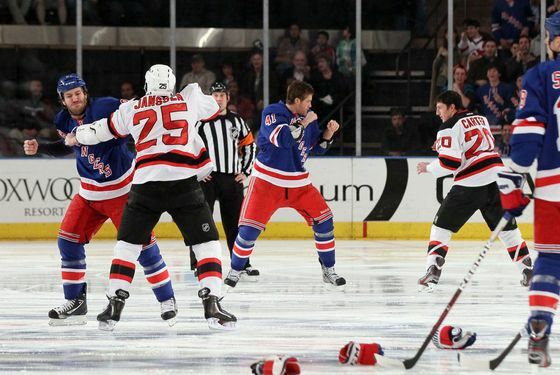 That’s basically the chronology of how last night’s Rangers-Devils game played out. First came the fighting: All six forwards on the ice to start the game dropped their gloves as soon as the puck was dropped — or perhaps more accurately, all six players who lined up as forwards, what with Stu Bickel taking the opening face-off and Brandon Dubinsky lining up as a defenseman. (Officially, those fights took place at 0:03, but really, they were inevitable as soon as the Devils — and then the Rangers — set their starting lineup.) But once the extreme viciousness of those opening seconds gave way to a more reasonable level of nastiness, a hockey game broke out, and the Rangers picked up two big points to extend their lead over the Penguins to three points. The season series between these teams is finished now, and we’re sticking with what we said last month: The Rangers fan in us isn’t wild about seeing the Devils in a postseason series. We think the Rangers are the better team — they earned seven points in head-to-head match-ups this year, to the Devils’ six — but New Jersey is good enough to beat them in a best-of-seven, and at the very least, a long, hard-fought series between these teams would be especially draining. That said, the hockey fan in us realizes how entertaining such a series would be. Speaking of the playoffs: The Rangers officially earned their postseason berth last night. And we don’t think we’re burying the lede here: We’ve known for some time this team was going to the playoffs and that all that would be determined in these final weeks is their seed. That said, it’s nice that simply getting into the playoffs isn’t worth celebrating the way it was, say, last year, when the Rangers didn’t punch their ticket until the season’s final weekend. (Or, for that matter, the way it would have been celebrated the year before that, had the Game 82 shootout in Philadelphia gone their way.) If one of the goals of this season — and this was certainly something we were hoping for — was to comfortably make the playoffs without having to sweat things out in the final week, then that mission has been accomplished. But there are more important missions ahead.